'Star Trek' Animated Comedy Series Warping to CBS All Access! 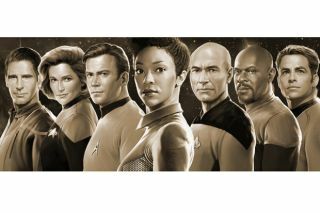 CBS has announced plans for Star Trek: Lower Decks," an animated comedy set in the "Star Trek" universe coming to the CBS All Access streaming service, according to TV Guide. The series will focus on the lowest ranking crewmembers on one of the least notable ships in Starfleet - essentially the exact opposite perspective of most Star Trek shows. The series is being developed by producer Mike McMahan. McMahan will serve as executive producer alongside Alex Kurtzman, Heather Kadin, Rod Roddenberry, Trevor Roth and Katie Krentz. "Mike won our hearts with his first sentence: 'I want to do a show about the people who put the yellow cartridge in the food replicator so a banana can come out the other end.' His cat's name is Riker. His son's name is Sagan. The man is committed,'" said Kurtzman in a statement. No projected release date for "Star Trek: Lower Decks" has been announced.